Is CEO pay the major cause of income inequality in the District? Increasingly the corporate ladder you’re on matters more than where you are on the corporate ladder. Much of the attention on the causes of growing income inequality has been focused on the difference in pay among the very top earners and the pay of other employees. CEO and executive pay is an important factor in explaining growing income inequality both nationally and locally. However it is the widening gap in median pay between different occupations that explains why income inequality in the District is higher compared to other parts of the nation. In 1975 a salesperson working in the District, in a middle to upper middle position in her/his career, would likely have been a middle class resident. Today she/he is considerably less well off than an entry-level attorney. We will discuss some of the implications of this growing disparity but we begin by looking at the data to illustrate this point. As shown above, the top 10 percent of earners in the District across all occupations made more than six times the lowest ten percent. The disparity in earnings in the District was higher than any of the 10 largest states, and in fact was higher than all 50 states. When we looked at this same ratio of wages of top earners compared to low earners within individual occupations, the results were significantly different. 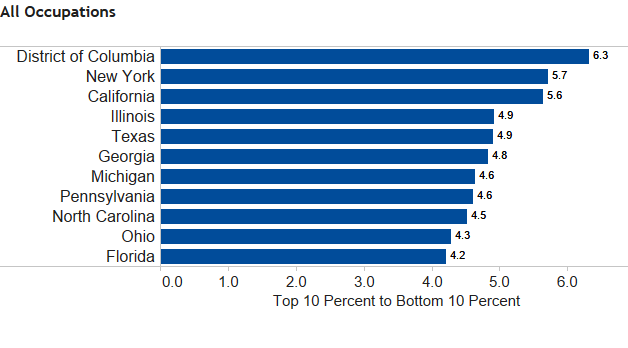 Interestingly for high paid occupations (like legal, and business and financial occupations), the ratio of wages for the top 10 percent of earners compared to the bottom ten percent was lower in DC than the ten largest States. For example, the top ten percent of earners in business and finance occupations in the District made 2.8 times the lowest 10 percent. In New York, this ratio was 3.6 percent. The same result, the lower disparity among pay, was also true for legal occupations. This may be due to the larger presence in DC of legal occupations within the government sector, where salary ranges even for the highest level are narrower compared to the private sector. This does not imply the top ten percent of earners in the District made less than their counterparts in other states. What this says is that the relative difference between top earners and low earners for these high paying occupations is less pronounced in the District compared to other States. For low paying occupations such as food services, the earnings ratio of high paid earners to low paid earners was somewhat higher in the District compared to other states, but not significantly different for other low paying occupations like sales. 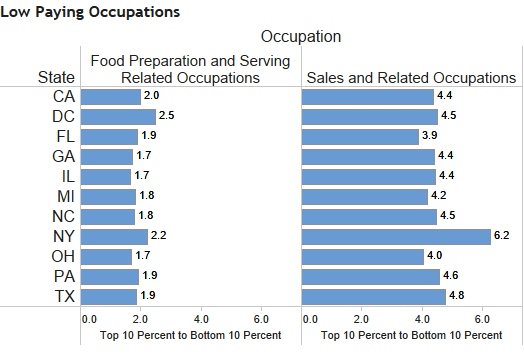 Overall, for most low paying occupations, the data does not indicate that the difference between the top earners and the lowest paid earners in the District is higher than in other parts of the nation. So why is income inequality in the District greater than in other parts of the nation? The cause is not the greater difference in pay within any particular occupation (along the corporate ladder). Rather it is due to a greater disparity in pay across industries (which corporate ladder you’re on). 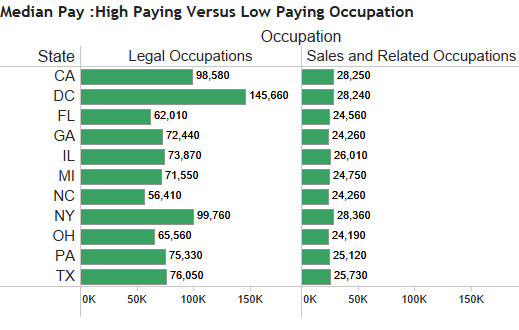 The data below compares median pay in high-paying occupations such as legal, to low-paying occupations such as sales. 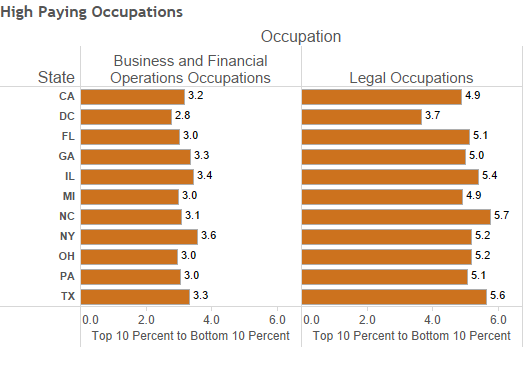 In DC the average person employed in legal occupations earns almost 5 times the pay of an average employee in sales. In California and New York the ratio is about 4 times and in North Carolina and Texas the ratio is 3 times. The larger disparity in median pay between high paying occupations and low paying occupations explains in large part the District’s higher income inequality relative to other parts of the nation. This has many implications. The likelihood that someone in a low paying occupation can attain middle class status by moving up their career ladder is lower in DC than other parts of the nation. The skills and experience that in the past led to middle class status are more limited today to certain occupations. Without these skill sets it is unlikely that a person can attain middle class status even by rising up the corporate ladder through work experience. Data in this report is from the BLS Occupational Employment Series. Probability sample panels of about 200,000 establishments are selected semiannually. Total 6-panel un-weighted employment covers approximately 78 million of the total employment of 136 million. One limitation of this data set is that it does not cover non-production bonus pay such as such stock options. These types of compensation could account for an increasing proportion of pay at the high-end of the income distribution, particularly for the top 1 percent which would include CEOs. The occupations that pay bonuses tend to be clustered in high paying occupations such as legal services, finance and information services, so that the general results here- that the corporate ladder you’re on increasingly matters more than where you are on the corporate ladder still hold. 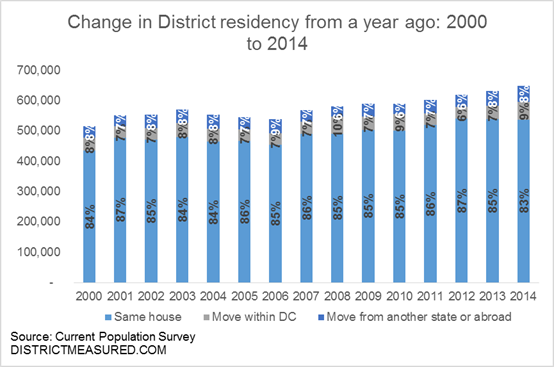 The District added about 90,000 net new residents between 2000 and 2014, but the population churn has been great. Current Population Survey data show that more than half a million people report moving to the District from some other state or jurisdiction during that period—this is on average 8 percent of the city’s resident population every year. Residents also move within the city frequently: In 2014, for example, nearly 60,000 residents moved houses within the city—this is approximately 9 percent of District’s resident population. Jobs—or the prospect of one—is the top reason why the District receives new residents from other states. 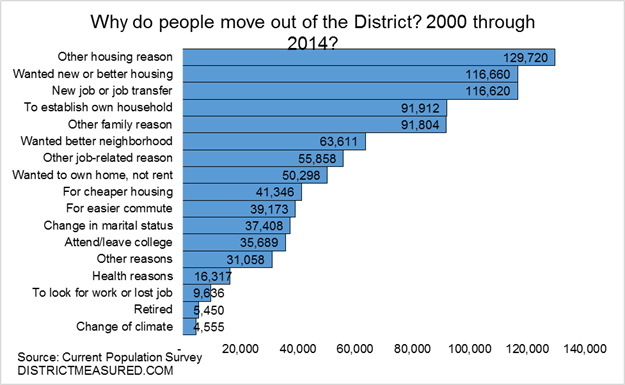 Between 2000 and 2014, the District received nearly 165,000 new residents because either they got a job in the District or their job was relocated in the District. Another 55,000 moved here to attend college, or they had just completed college, and found the District to be an attractive job market. Not all of these newcomers stayed, but it is interesting to see that over 42 percent of District residents who had moved to the city sometime in the previous 12-month period did so for their careers. Convenience of living in the city follows jobs, with another 10 percent of District residents suggesting that they moved into the city for an easier commute. Why do people move out? It is housing. 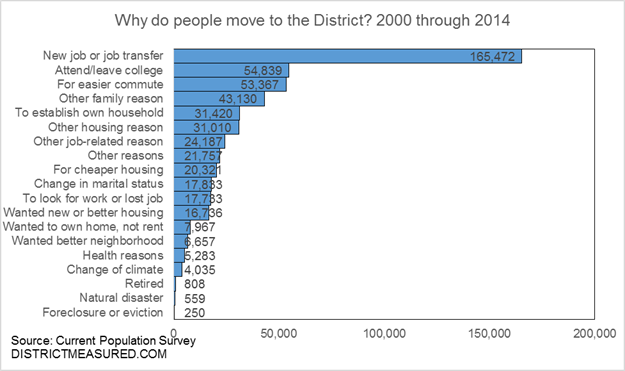 The top two reasons people report moving out the District in the last fifteen years have to do with wanting better housing, seeking cheaper housing, or wanting to own a house, for example, and these reasons account for 36 percent of the moves out of the District whereas they account for only 12 percent of the moves into the District. Jobs however, account for 12 percent of the people moving out compared to 32 percent moving in. Incidentally, suburbs do a better job in attracting District residents than the other way around. 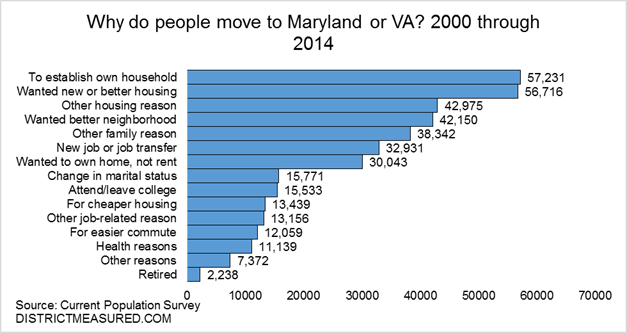 Between 2000 and 2011, the District sent 391,000 of its residents to Maryland or Virginia (42 percent of those who left the city), but received only 191,000 new residents from these two states (30 percent of the residents who moved into the city). Looking at the reasons why people move to the suburbs, housing still plays a role, but the top reason is to establish a household. It appears from the data that those who share housing in the District with roommates are most likely to move out to the suburbs when they want a place of their own. What exactly is this data? Data on move rates are extracts from the Current Population Survey data maintained by Miriam King, Steven Ruggles, J. Trent Alexander, Sarah Flood, Katie Genadek, Matthew B. Schroeder, Brandon Trampe, and Rebecca Vick. Integrated Public Use Microdata Series, Current Population Survey: Version 3.0. [Machine-readable database]. Minneapolis: University of Minnesota, 2010. The sample for the District is small–therefore the post looks at a combined 15 year period. Note: an earlier version of this post was published before the draft was completed.